I can’t remember a time in my adult life when money wasn’t carefully considered and budgeted. (Unlike my childhood when I would walk to the Mini-Market and buy whatever I wanted, because in the 1980’s five dollars could get you more candy than you could handle!) While I’ve always loved to pour over magazine spreads that feature money-is-no-object spaces, in reality, most rooms in our home are the money-is-no-object-because-there-is-none kind. 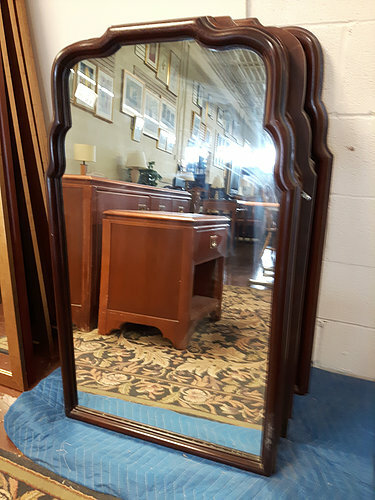 But since I want our house to resemble a grown-up’s house and not a frat house with milk carton end tables, I’ve had to learn to hone my bargain hunting skills. This goes way beyond the clearance sections at Target. I’m talking about deep, deep discounted merchandise. The photo above is a corner of our house that is entirely thrifted (or gifted in the case of the carved statues). Here are my favourite places to score super cheap and sometimes free stuff for our home. This online classified ads site is similar to Craiglist but only in Canada. 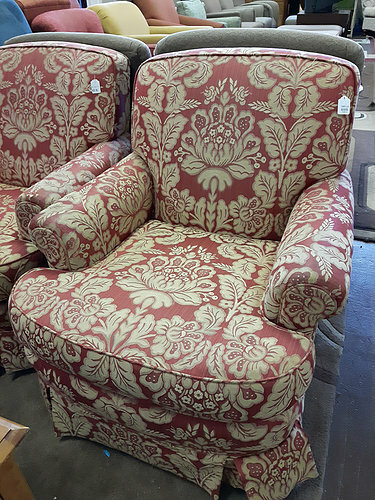 This is my go-to site for just about everything from sofas to coffee tables to patio furniture and even renovating materials. I love buying second hand for it’s low environmental impact and the low impact on my bank account. 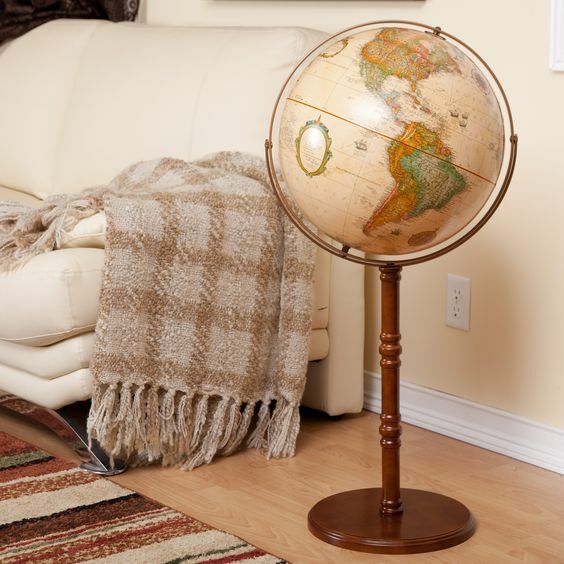 It’s a great place to find one-of-a-kind, vintage and antique items too. And for when you’re really, really broke, Kijiji also offers a swap/trade section and a free section. I’ve seen some of the most amazing things being offered for free over the years. It’s okay to offer a better price or as ask the seller for a discount, whenever I list anything on Kijiji I set the price knowing I’ll likely take less for it. 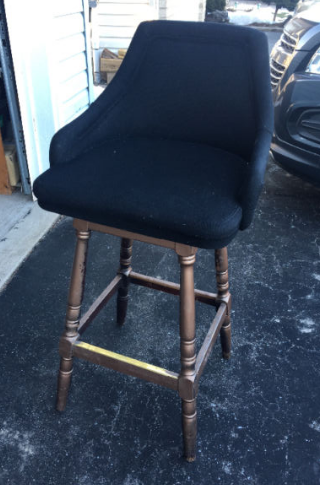 This black fabric bar stool just needs a new coat paint, or a bit of stripping and sanding on its legs (it looks like it had a spray tan incident!) and it would look right at home pulled up to a marble-topped island. No one would ever guess you only paid $35 for it. 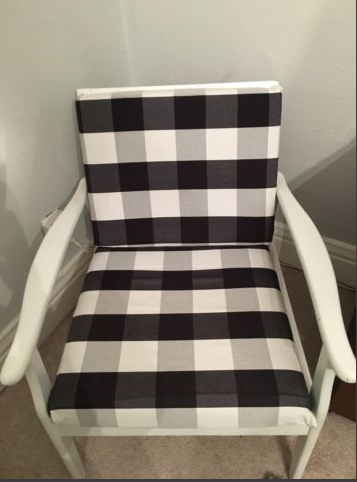 This lovely chair is being offered for a mere $50. 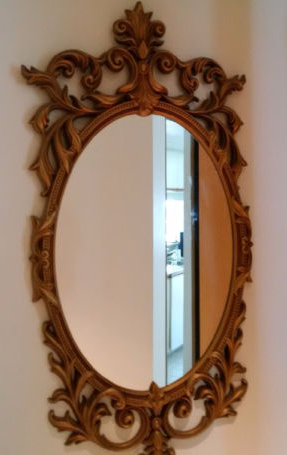 A hand carved, wooden framed mirror for $40? Yes please! 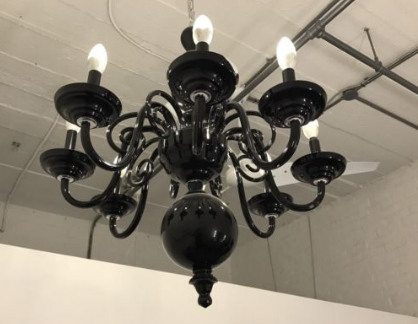 I don’t have a place in my house for this Italian glass beauty, but for only $175 I really wish I did! 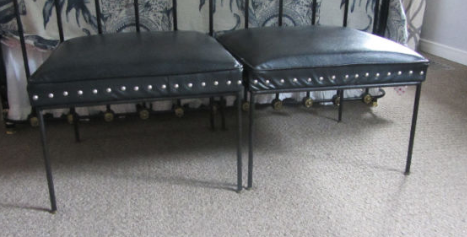 This set of benches (could easily be used as a coffee table) is $100. You could probably take them home for $75 if you ask nice. Here’s what I love about thrift stores: they have never ending, always changing stock, the prices are clearly marked, you normally won’t find broken or damaged items, and the staff never ask if they can help you find something or start a fitting room for you. There is zero pressure to buy and lots of freedom to browse. 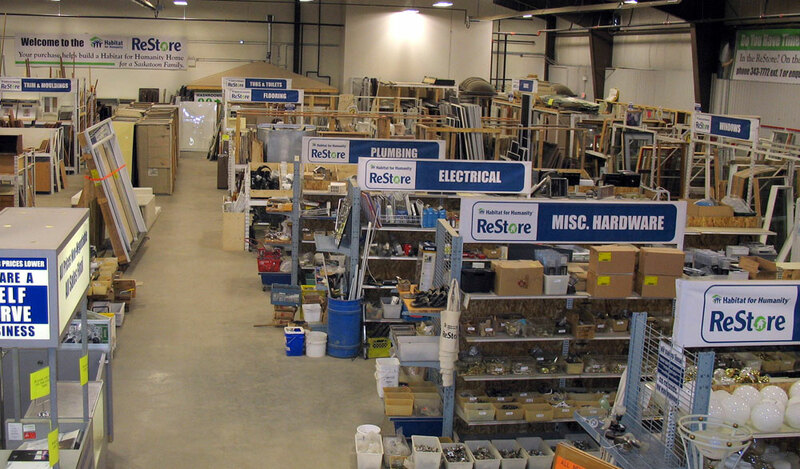 Since the stock is constantly being overturned you need to go often enough to see if they have what you’re looking for. 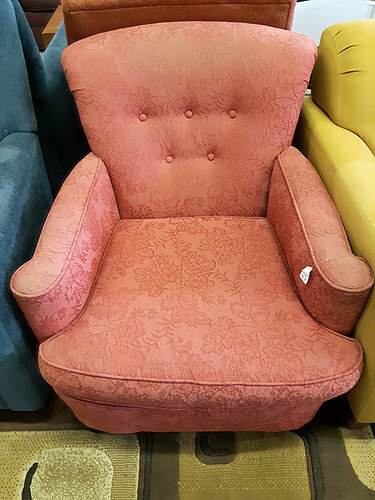 If you have your heart set on finding an antique buffet to repaint or a quirky vintage chair, going often to multiple stores is key to getting what you want. You can always ask the store manager to contact you if the particular thing you want ever gets donated. Be ready to sift through lots of bad stuff to get to the good. I love the thrill of garage-saling! The trick to finding good stuff is to go early and then again late. Show up right when the sale is starting to snag the best goods and then again near the end to see what’s leftover. Most people are happy to discount or give away stuff at the end of their garage sale. In my experience, sales in wealthier neighbourhoods are usually (but not always) a let down. 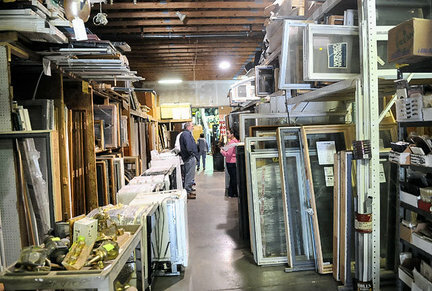 The items are often priced way too high and there isn’t the same volume of stuff to make it a really good sale. I want to rummage through boxes of china, and stacks of books and venture down to a musty basement to see someone’s grandmother’s dresser. Here’s another place to ask for a better price. I’ll sometimes just offer an amount for something instead of asking the price. The worst that can happen is that you’ll be told no. 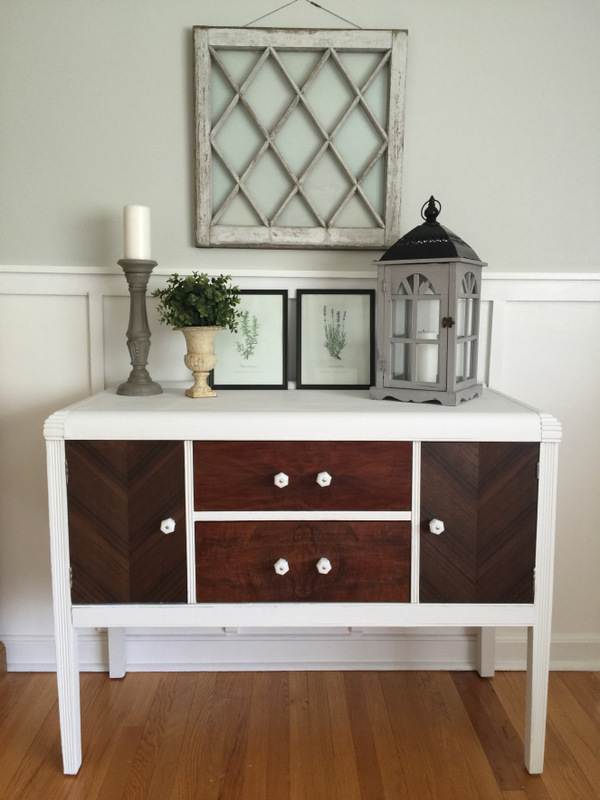 The best is that you’ll walk away with a beautiful antique sideboard for $5. Doesn’t “rescued” sound way better than saying “garbage-picked”? Growing up, our community had a yearly large item pick up when people could put out old appliances and furniture. As kids this was the best night of the year (other than Christmas Eve and Halloween of course). I remember driving around with my dad looking for treasures. We scored bicycles, toys and furniture this way. If your community offers this and you’ve never trolled the streets then you’re missing out on serious bargains (free!!!) for your home. It’s not like dumpster diving or pawing through people’s actual bags of garbage. In most cases these are items that have been just placed at the curb. If your community doesn’t offer this then try to keep a look out on garbage day. If you live near a university or college take a drive around the student housing areas near the end of school year. You’ll find desks, chairs, dishes and more piled with lots of gross garbage (like moldy pizza boxes and beer bottles filled with ants and cigarette butts) so this one may not be for the garbage-picking rookie. Most of the furniture in my youngest daughter’s bedroom has been rescued, with the exception of the bed. But her room was not quite photo ready (ahem) when I was writing this! The gorgeous brass shelves in the background -picked from the garbage! 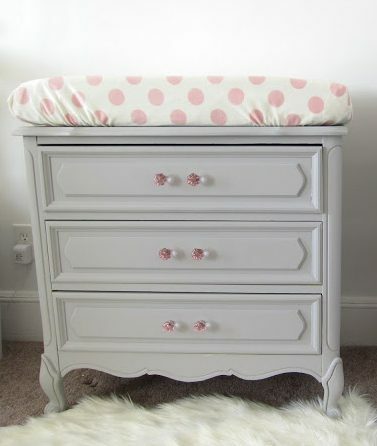 A quick coat of paint and new pulls and this curb side dresser is just the sweetest little changing table. 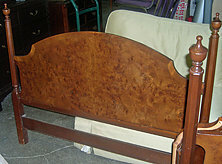 Click on the link under the image to see the amazing before & after of this side of the road find. You’ve probably driven by these stores and have no idea the deals that are waiting inside. They often look like cheap used car dealerships with gaudy signs promising rock bottom prices. Well, one day we actually went into one of these places. We had only $300 left after renovating the basement in our previous house. We needed a sofa to make the family room functional and I was determined to find something halfway attractive and in our budget. Weeks of Kijiji searching turned up nothing so we decided to check out a furniture liquidator. A lot of the furniture being sold was what I expected; poor quality junk made from fake wood and questionable, shiny fabric. But then we spotted a blue (my favourite colour) couch in the back of the store. 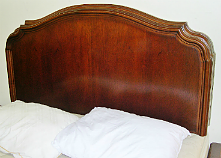 Compared to the rest of furniture the sofa looked really well made. The price was listed at $300. When I lifted the cushions to inspect the sofa I found the Decor-Rest label. A quality, made-in-Canada sofa for only $300. I was over the moon happy! My husband was actually able to get them to knock off an extra $50 just by asking (he’s awesome like that) and we took it home in our mini-van. Here’s the sofa in our current living room. Almost everything in this photo is thrifted, found, or liquidated. These could easily be painted for a custom look. 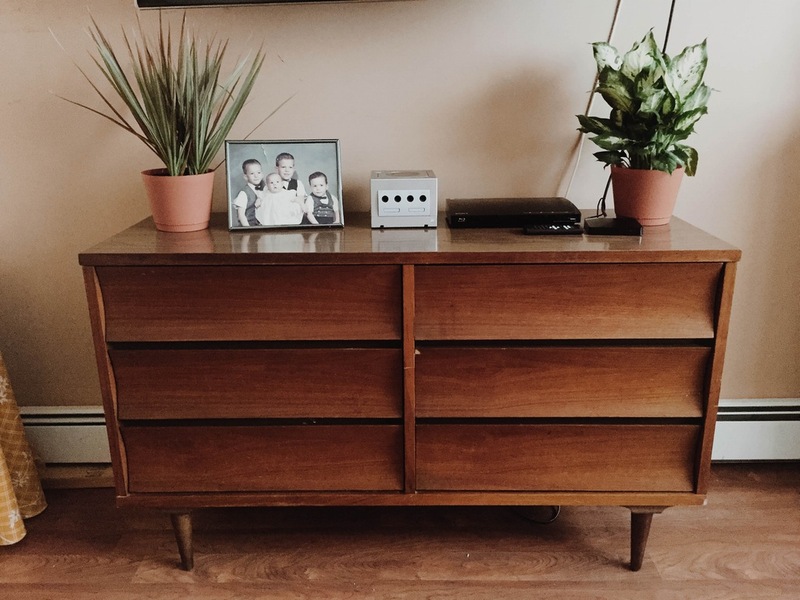 If you’re willing to paint or refinish there’s lots of other good, solid pieces including dressers, tables and desks just waiting to look amazing in your home. IKEA probably has the the most famous and well stocked As-Is section. Lots to choose from but buyer beware as many of the products are chipped, broken or ripped. 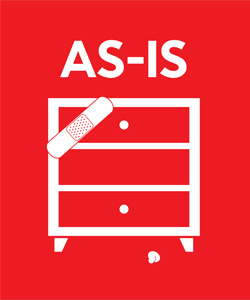 We found the As-Is most useful when we were installing our IKEA kitchens. If we forgot a side panel we would check here first and find something that we could cut to fit for a fraction of the price of buying a new one. The great thing about IKEA kitchens is that many of the kitchen styles use the same base cabinets regardless of the finish. We snagged a few already assembled cabinets here as well. None of these money saving options are as easy as walking into a store and picking out exactly what you want or ordering something and having it delivered right to your door. 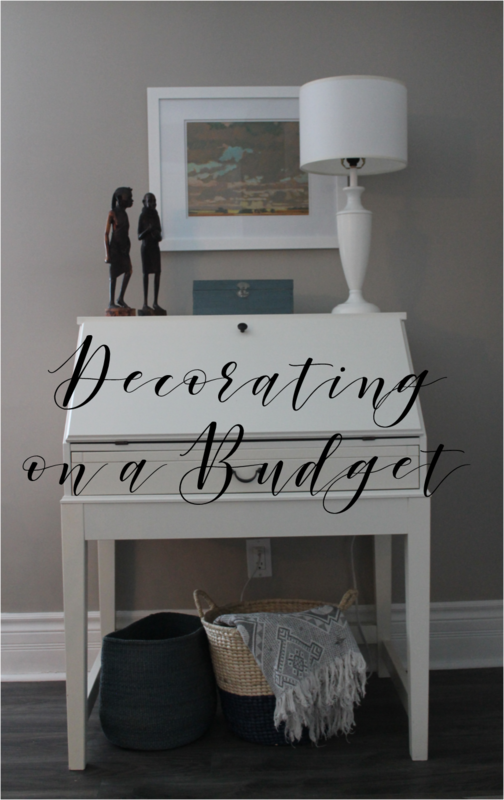 Decorating on a budget does take time and effort but it’s so worth it! 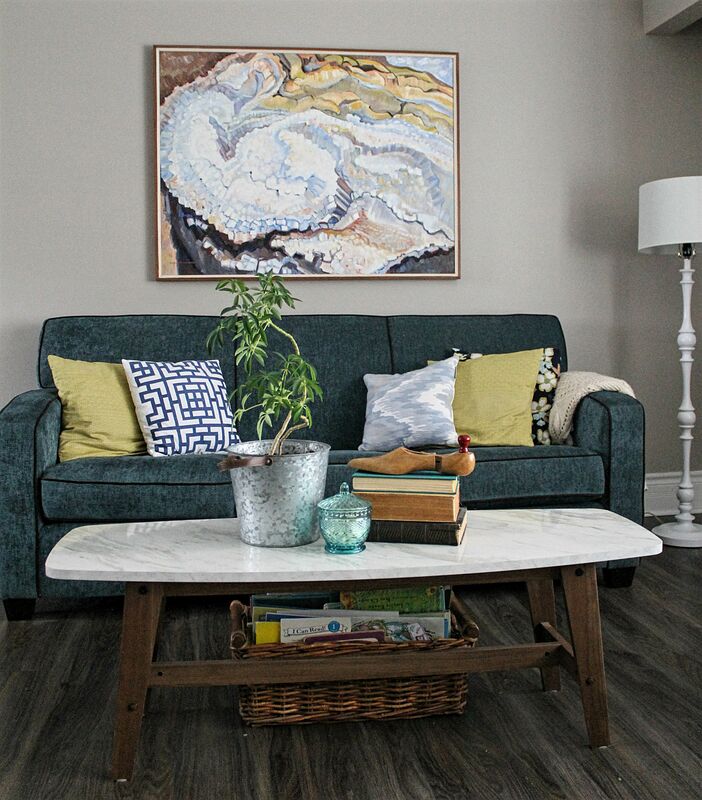 Your house will look put together over time with unique, collected pieces that reflect you and you’ll still have money leftover to enjoy life in your house. < Previous Collect Them All!